Editor’s note: Tien Tzuo is the co-founder and CEO of Zuora. With the number of mobile phone subscriptions shortly expected to exceed the total global population, what is the next great connected device going to look like? Hint: It’ll have four wheels. Gartner predicts that there will be 250 million connected cars on the road by 2020. That means one in every three cars on the road will be connected. By then, digital diagnostics, infotainment channels and enhanced navigation systems are expected to constitute a $270 billion industry, up from $47 billion today. The only problem is that, now, the automobile industry is looking a lot like IBM did in 1985. The automobile industry seems to have effectively ceded their dashboards to Google and Apple. In 1985, Big Blue employed over 400K people (five times the size of Apple today). Digital Equipment, its nearest rival, had a quarter of its employee base. Apple itself was in a tailspin, having just fired Steve Jobs in one of the most famous HR decisions in history. 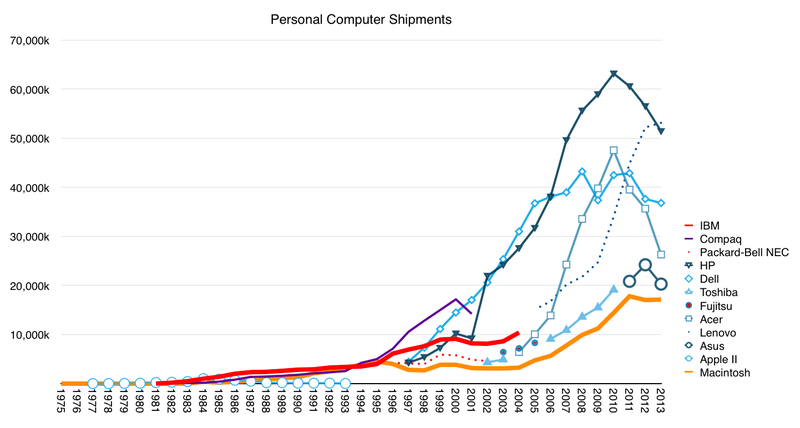 Personal computers were an admittedly low-volume market at the time, but the IBM PC dominated it. Compatibility with its PCs was an industry mandate. It had clear market superiority. IBM had the hardware wrapped up, it just needed a decent graphical user interface. The same year, Microsoft, which had roughly 2,000 employees, introduced Windows. That was the beginning of the end for the IBM PC business. By the early 1990s IBM-manufactured PCs were the exception rather than the rule, and the industry revolved around Windows. Once that happened, I didn’t care about whether or not my PC came from IBM. I only cared that it ran Windows. I was in very good company. By 1996 Microsoft had a market cap of $72 billion, while IBM was worth $60 billion. This is exactly the issue that the automobile industry faces today. IBM lost the war by giving the operating system to Microsoft. Right now the car companies are pulling the same move. Apparently judging that the customer knows best, the automobile industry seems to have effectively ceded their dashboards to Google and Apple. And it wasn’t even much of a fight. With the exception of a few notable dissenters including Toyota, several dozen automobile manufacturers have given up their infotainment and messaging layers to Android Auto or Apple CarPlay (or both). As a result, the auto industry is in danger of handing over the keys to Silicon Valley. Cars will become commodified, and as long as it’s running CarPlay or Android Auto, I won’t care what I’m driving. This is not an argument for kludgy closed systems. It’s an argument against the prevailing wisdom that cars are turning into cell phones on wheels. It’s an argument for the primacy of the driving experience. What if the auto industry used these new connected sensors as a way of demonstrating what makes their cars truly special? As a way of showing drivers how their cars perform in different driving conditions? How it manages to help them save money and the environment with smart fuel-efficiency systems? The auto industry needs to present a vision of the connected car that goes beyond Google Maps and Spotify. How can it do that? Keeping drivers consistently and happily surprised with new services. Tesla’s own Model S firmware changelog is a pretty remarkable document – take a look. Over the past few years Tesla drivers have woken up to discover that their cars can suddenly respond to voice commands, account for real-time traffic conditions and automatically adjust their suspensions. Taking advantage of usage patterns to help customers become better drivers. Examples of this include avoiding hard brakes, erratic lane shifts and speeding tickets. Automatic makes a diagnostic port plug-in device that can flag dangerous driving behavior (a particularly worthwhile feature for parents of teenagers), as well as decode engine light alerts and offer commute suggestions that improve fuel efficiency. Offering reasonable, consumption-based insurance and maintenance packages. Metromile sells a device that enables per-mile insurance, saving their customers around $500 a year. They recently teamed up with Uber so that their drivers only have to pay insurance for miles they drive for personal use. Treating their dealerships like genius bars, not check-out counters. GM’s Onstar service emails a monthly vehicle diagnostics report to your dealer in advance, so the inventory details are already taken care of by the time you arrive. Making cars that can talk intelligently with your home and your office. Mercedes-Benz drivers can adjust their Nest thermostats through their dashboards. Drivers using AT&T’s new connected car service will be able to unlock their doors, check their home security cameras or start a pot of coffee. But most importantly, the auto industry needs to empower its drivers and bring back the romance of the ride. It’s 1985 all over again. And unless the auto industry takes control of its dashboard, it’s going to wind up like IBM.